Use the form below to contact accommodation Villa Taman Sorga directly. 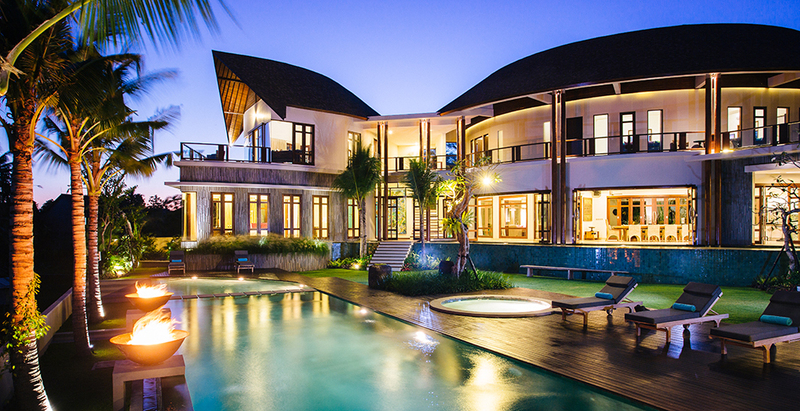 Larger families and groups of friends will feel the gravitational pull of Villa Taman Sorga. Its name meaning ‘heavenly garden’, this spacious tropical oasis promises a divinely relaxing vacation that will keep a dozen guests of all ages on cloud nine. Taman Sorga has a great choice of living space so family and friends can enjoy social time together as well as quiet time apart. 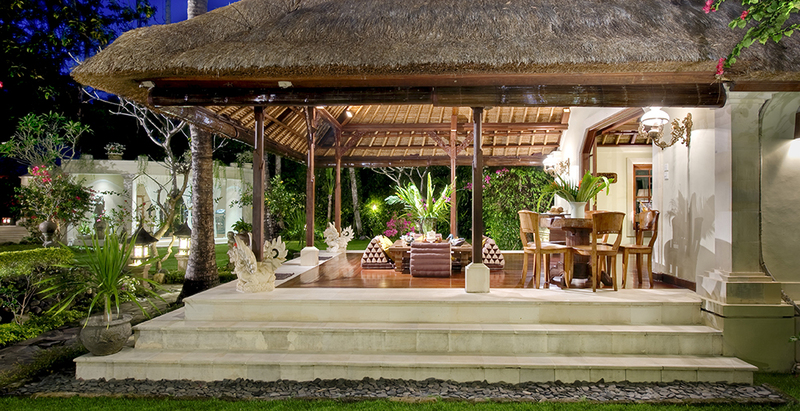 At the villa’s social heart is the wantilan-style living pavilion with its impressive two-tiered vaulted roof. This stately room can be flung open for semi-alfresco living or closed for air-conditioned comfort. Daytime, guests converge on the Bougainvillaea-draped pavilion by the 17-metre pool, sprawling on the oversized daybed or plumply cushioned chairs. The villa offers a sumptuous selection of eating areas: in the dining pavilion, there’s a formal air-conditioned section with a table for 12 plus an open-sided section furnished with a breakfast table and low table for Asia-style eating; then there’s a poolside dining terrace and an air-conditioned kitchen-diner where wonderful meals are whipped up by an accomplished cook – part of a long-serving team dedicated to looking after guests. The six large air-conditioned bedrooms are sensibly configured to give guests lots of personal space, privacy and flexibility – three with king-size beds, two twins (convertible to kings), and one with two doubles. Alongside heritage furniture and antiques are contemporary gizmos: satellite TVs and DVD players in each room, marble bathrooms with hydro-massage showers and (in most) jacuzzi or bathtub, plus a media room and gym. 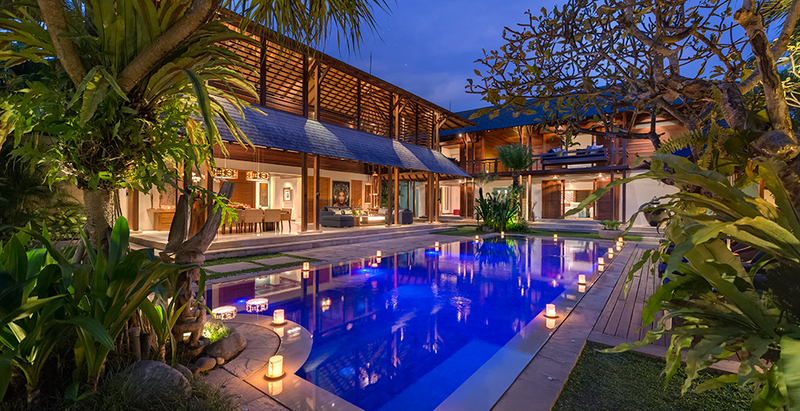 Located in a genteel residential area away from the bustle of the hotel belt, Villa Taman Sorga is a short stroll from the southern end of Sanur beach. With its shallow waters and strip of golden sand, the beach makes a perfect playground for the kids while parents enjoy a cold Bintang beer and fresh-from-the-fishing-fleet seafood in one of the eateries dotting the shoreline. 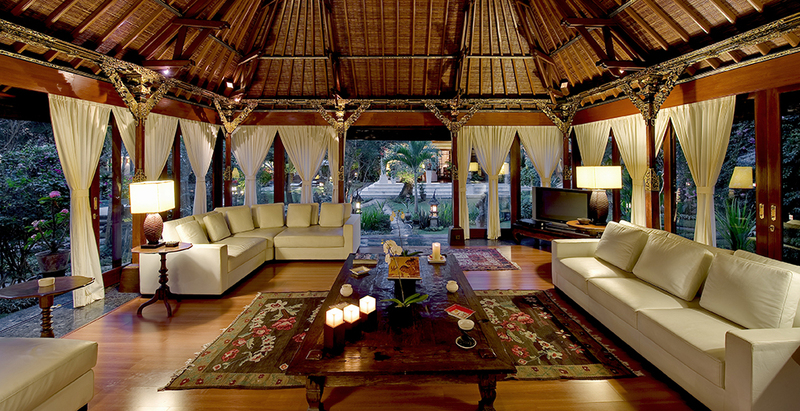 – Wantilan living pavilion with multiple seating areas and a 42-inch TV and home cinema system under a two-tiered roof. – Second living area on the deep veranda of the main house. – Thatch-roofed dining pavilion with formal table for 12. – Casual Thai-style dining at low table with floor cushions on the veranda. – Large media room with two seating areas, 50-inch satellite TV and DVD player with home cinema system (attached bathroom with twin basins and a hydro-massage shower). 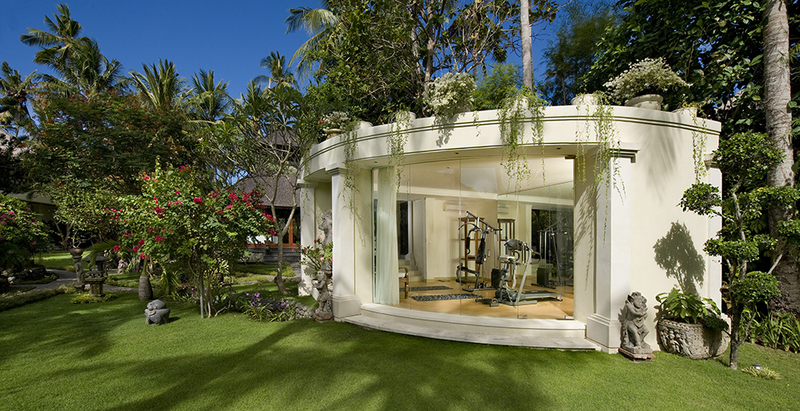 – Air-conditioned gym with Attack USA treadmill, X2Fit weight station, yoga mats and 32-inch TV. 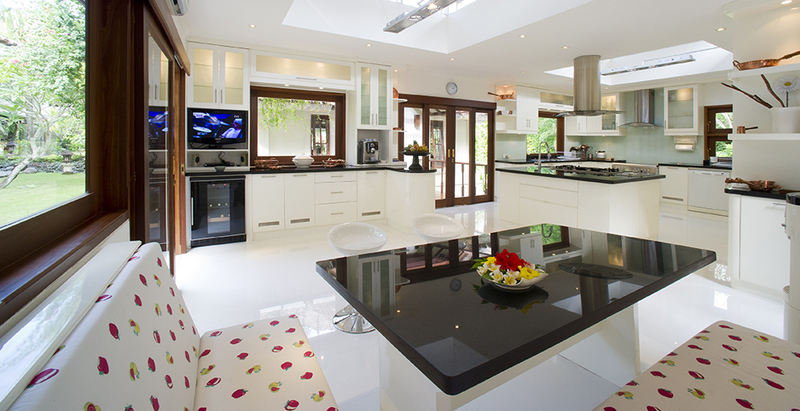 – Exceptionally well-equipped air-conditioned kitchen with breakfast area. – 17-metre lagoon-style swimming pool with bridge raised over the centre. – Bougainvillea-draped pool pavilion with seating area and over-sized daybed. – Sunbathing area with loungers and parasols. – Poolside dining terrace with circular table and six armchairs. – Extensive verandas and seating areas outside the bedrooms. – Beautiful gardens full of tropical flowers and mature trees. 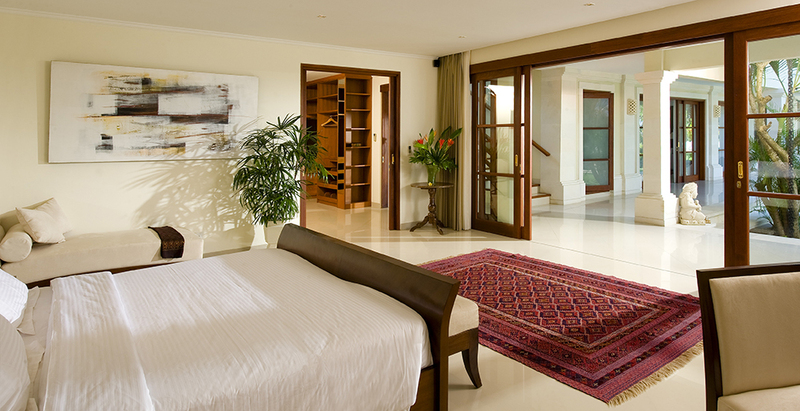 – Ground floor master bedroom with polished Merbau-wood floor and sliding glass doors onto a terrace. – King-size four-poster bed and antique furnishings. 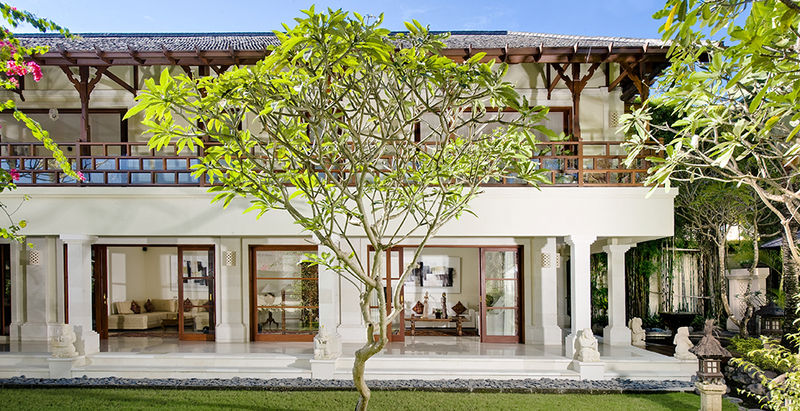 – Conservatory-style bathroom with hydro-massage shower, double vanity, and Balinese carved doorway to WC. – Upper floor master bedroom featuring handsome antiques, including stately ceremonial beds. 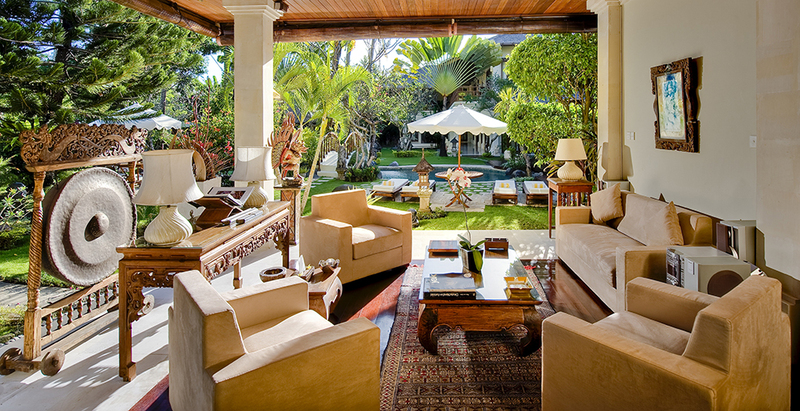 – Double doors onto enormous veranda with several seating areas and an antique daybed. – Large ensuite bathroom with jacuzzi and hydro-massage shower. – 43-inch satellite TV and DVD player in both suites. – Two spacious air-conditioned bedrooms – one upstairs, one down. – King-size beds and contemporary furniture including chaise longue and armchairs. – Large walk-though air-conditioned dressing rooms. – Huge marble-lined air-conditioned bathrooms with jacuzzis, hydro-massage showers, twin vanities, and bidets. – 32-inch or 43-inch satellite TVs, DVD players, and surround-sound systems. – Two guest suites open onto a long balcony on the second floor of the guest wing. – Air-conditioned, with twin beds that convert to kings. 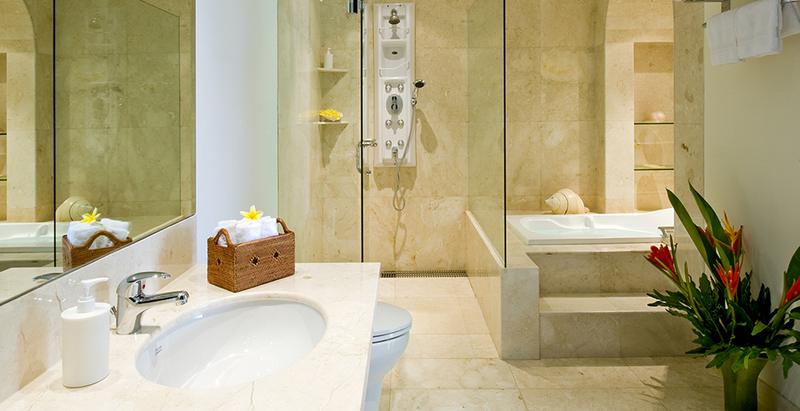 – Air-conditioned bathrooms with bathtubs, double vanities, and hydro-massage showers. – Both rooms have 32-inch satellite TVs, DVD players and surround-sound systems. LOCATION : Sanur, south-east Bali, Indonesia. CAPACITY : 12 (6 bedrooms: 3 with twin beds, 2 with kings and 1 with queen-size bed). A small single room is available for guests travelling with a nanny. LIVING AREAS : Air-conditioned living pavilion; terrace living area; dining pavilion – air-conditioned section with table seating 12 and casual veranda section with breakfast table and low table with floor cushions; media room; pool pavilion and covered terrace. POOL : 17m x 5m lagoon-style pool. STAFF : Villa supervisor; cook and kitchen helper; housekeepers; gardeners; maintenance, security. Babysitters and spa therapists available (on guest account). DINING : Indonesian, Asian and international menu. Special requests and dietary needs are accommodated. COMMUNICATION : Interconnecting phones in all rooms for local calls; WiFi internet access; mobile phone coverage. ENTERTAINMENT : 50-inch TV with home cinema system in media room; 42-inch satellite channel TVs and DVD players with home cinema system in four bedrooms; 32-inch TVs and DVD players in two bedrooms, kitchen and gym; music system; bluetooth speakers. 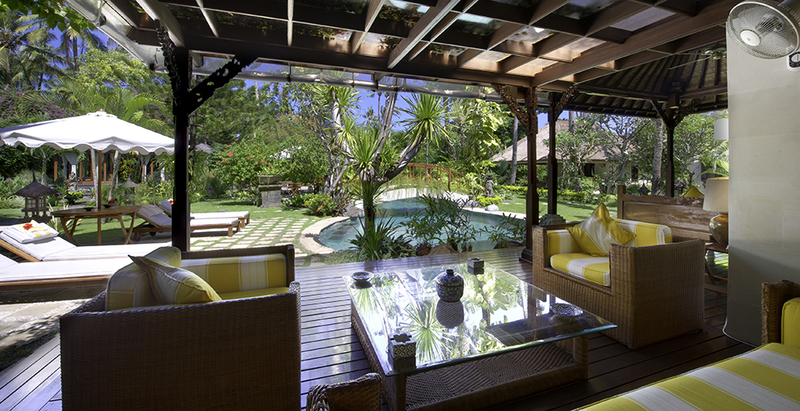 FOR FAMILIES : With its flat lawns and shaded terraces, Villa Taman Sorga is a popular villa for families. Facilities for younger guests include a baby cot and high chair. TRANSPORT : On request, the villa staff will call one of Bali’s safe and reasonably priced metered taxis, or organise a car and driver (on guest account). Bicycle hire is also available. ADDITIONAL FACILITIES : Gas barbecue; in-room safes; back-up generator; gym with treadmill, weights and yoga mats. PROPERTY AREA : 1,082sqm (villa); 3,709sqm (land). LOCATION : Sanur, south-east Bali, Indonesia. CAPACITY : 12 (6 bedrooms: 3 with twin beds, 2 with kings and 1 with queen-size bed). A small single room is available for guests travelling with a nanny. LIVING AREAS : Air-conditioned living pavilion; terrace living area; dining pavilion – air-conditioned section with table seating 12 and casual veranda section with breakfast table and low table with floor cushions; media room; pool pavilion and covered terrace. POOL : 17m x 5m lagoon-style pool. STAFF : Villa supervisor; cook and kitchen helper; housekeepers; gardeners; maintenance, security. Babysitters and spa therapists available (on guest account). DINING : Indonesian, Asian and international menu. Special requests and dietary needs are accommodated. COMMUNICATION : Interconnecting phones in all rooms for local calls; WiFi internet access; mobile phone coverage. ENTERTAINMENT : 50-inch TV with home cinema system in media room; 42-inch satellite channel TVs and DVD players with home cinema system in four bedrooms; 32-inch TVs and DVD players in two bedrooms, kitchen and gym; music system; bluetooth speakers. 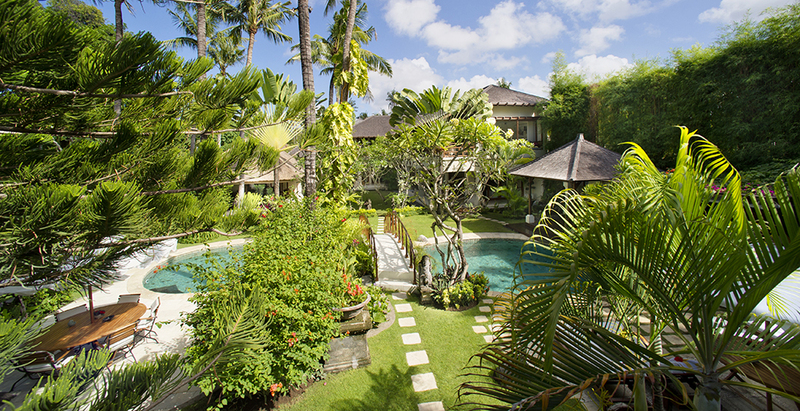 FOR FAMILIES : With its flat lawns and shaded terraces, Villa Taman Sorga is a popular villa for families. Facilities for younger guests include a baby cot and high chair. TRANSPORT : On request, the villa staff will call one of Bali’s safe and reasonably priced metered taxis, or organise a car and driver (on guest account). Bicycle hire is also available. ADDITIONAL FACILITIES : Gas barbecue; in-room safes; back-up generator; gym with treadmill, weights and yoga mats. PROPERTY AREA : 1,082sqm (villa); 3,709sqm (land). Sanur is a coastal stretch of beach of Denpasar city of southeast Bali, about 30 minutes drive from Ngurah Rai International Airport, which has grown into a little town in its own right. 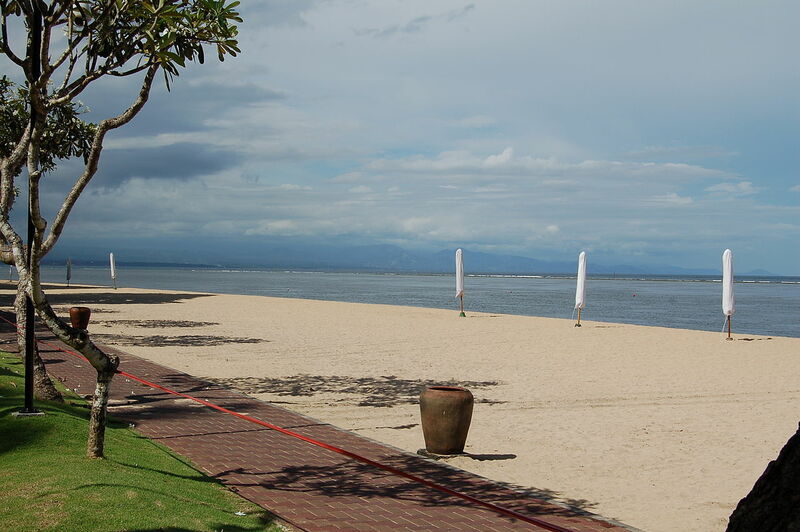 A 5.1 kilometers of the Sanur’s coastline from Matahari Terbit Beach to Mertasari Beach has been ready reclaimed in 2008. As with many of Bali’s beaches, Sanur has lost a significant amount of its sand and groins have been built to try to retain what remains. Comfortable salas sit on many of these making for a comfortable spot to while away a hot afternoon. Midway along the beach there is even one that can only be swum to (or waded to at low ride). Even though Sanur is not as hectic as trendy Seminyak, it is still heavily touristed and those seeking an untouristed Bali beach experience won’t find it here. This is one of the island’s original “tourist areas” and today is especially popular with families with kids. Occasionally referred to as “Snore” the pace here is far slower and sedentary than Kuta/Seminyak and by midnight just about everywhere is shutting up shop. The northern part of Sanur beach was used as the landing site for the Dutch invasion troops during the Dutch intervention in Bali (1906). During World War II, Sanur was again the entry point through which the Japanese forces landed to occupy the island of Bali. Today Sanur contains a number of hotel resorts such as the Fairmont Sanur Beach Bali and Bali Hyatt, The Zen Villas, etc. 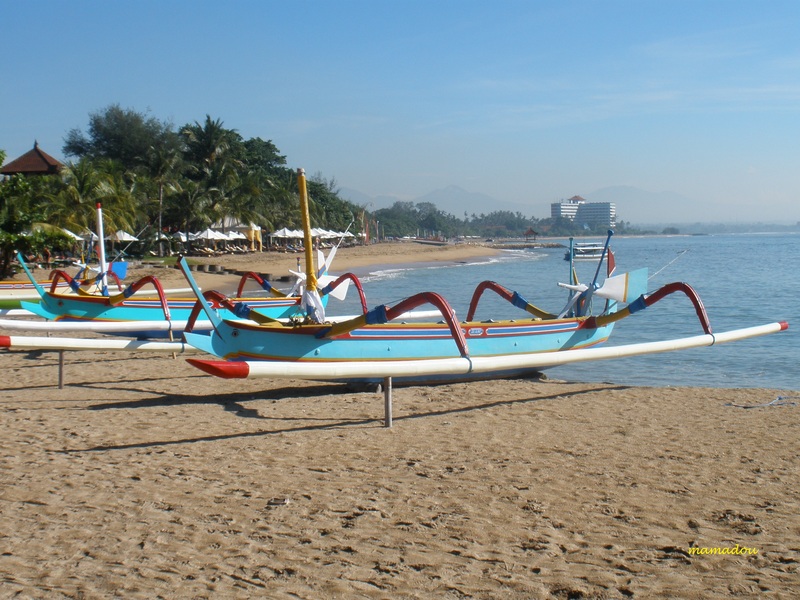 Traditional fishing boats can be seen on the beach of Sanur offering a scenic view of the island Nusa Penida. Le Mayeur Museum is a hidden treasure located right on the main Sanur Beach of Sindhum behind the array of art and souvenir stalls. This memorial museum mainly houses the artworks and personal history of painter Adrien-Jean Le Mayeur de Merpres, a Brussels-born artist who was impressed by Bali and the shores of Sanur, where he dedicated his entire life to the two things he loved the most: its arts and its women. He fell in love with a Legong dancer, Ni Pollok, who he later married and became his muse, extensively featured in his oil paintings. Sanur’s beachfront walk was the first in Bali and has been delighting locals and visitors alike from day one. Over 4km long, it curves past resorts, beachfront cafes, wooden fishing boats under repair and quite a few elegant old villas built decades ago by the wealthy expats who fell under Bali’s spell. While you stroll, look out across the water to Nusa Penida. Blanjong Temple - Pura Blanjong, Jl Danau Poso, Blanjong (just south of Sanur). The most notable temple in Sanur which contains a major, important inscription on a stone pillar called the Prasati Blanjong. The inscription tells of a Javanese king who visited Bali in the 10th century and installed what was probably Bali's first formal government. This is Bali's oldest known artifact. Turtle Conservation and Education Centre - Sea turtles, once a traditional commodity among the Balinese in the distant past, have turned to become a protected species, with major conservation efforts propping up around Bali. The Turtle Conservation and Education Centre (TCEC) that was set up on Serangan Island, is one of them. The TCEC serves as a hatchery, nursery and sanctuary for turtles accidentally caught by fishermen. The centre is open for the public and offers an educational day out, ideal for the whole family. A large variety of well shaded and open-air pools separate the turtles according size, with supervising staff ready to provide information and brief tours if they aren’t busy cleaning and maintaining the pools or feeding the turtles. Griya Santrian Gallery, located within the Griya Santrian boutique hotel in Sanur, is an open-air gallery that regularly hosts art exhibitions, book launches and art happenings featuring local and international artists. Easily one of the most reputable galleries of its kind in the Sanur area, it is definitely a must-visit for art and culture buffs. 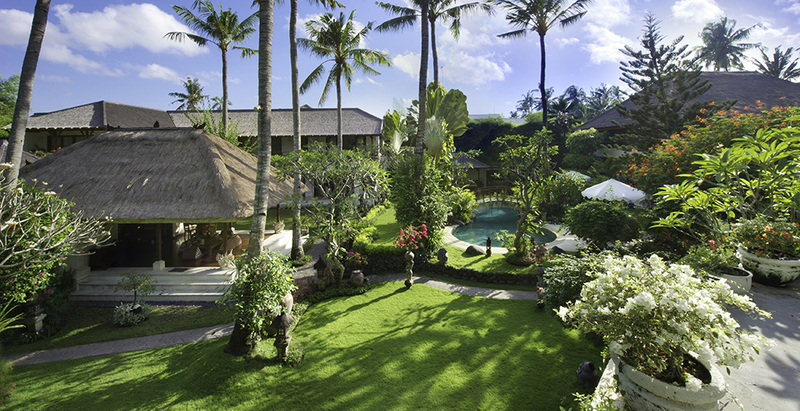 The Bali Orchid Garden is a must-visit for flower lovers and gardening enthusiasts. It is located amidst the rows of local garden shops along the Bypass Tohpati road north of Sanur, which comprise a variety of lush open-air collections and stalls selling tropical flora. The Bali Orchid Garden is the only of its kind here providing tours, and inside you will encounter a world full of natural colours. The Sindhu Beach art market is a collection of small different art and souvenir shops that you can find at the beginning of your long strolls or cycling tours at the northern end of the Jalan Segara Ayu beach path, starting from the namesake street of Jalan Pantai Sindhu and for about 400m further south. Shopping: Shopping in Sanur is a laidback and easygoing affair, much in line with the general character of this quiet beach resort area. While the number of hotels and restaurants in Sanur overshadow the shops and boutiques that line its major streets, there are a select number of locations offering arts and crafts, fashion items and curios to take back home as a personal memento or souvenir. Sanur's splendid paved beachfront cycle-path stretches some 5 km from the Jalan Mertasari area in south Sanur, north to the main beach at Jalan Hangtuah. This makes for a lovely scenic bike ride, especially in the early morning. Some bikes are better maintained than others so you might want to test your hire-bike close to home for a while in case the pedals have a tendency to fall off. Dancing: Adora Super Club forms part of the Harrads Hotel and Spa complex, and serves as Sanur’s only major nightclub. Formerly the Blue Eyes Café, this ‘super club’ is hard to miss as it is the first large venue you will see while heading east from Kuta along the Jalan Bypass Ngurah Rai. Diving: Although the diving available around Sanur is not the best Bali has to offer, nearly all of Bali's most established dive operators are located here. All offer trips further afield. A day at any of the spas in Sanur is exactly what you would expect during your stay in Bali: full service treatment steeped in Balinese tradition. Take advantage of any opportunity to enjoy a spa during your stay, the cost here is at least half what you would pay in North America or Europe. 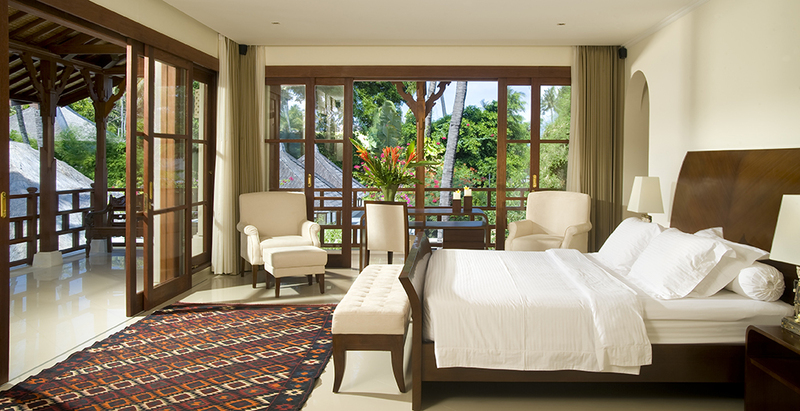 All major hotels have in-house spa facilities and there are also several well established independents in Sanur. Please check: www.baliwellnessguide.com the spa directiray for Bali. Sanur is one of the main beach resort areas in Bali that has a notably large collection of restaurants and bars that are set alongside traditional ‘warungs’ (local establishments mostly selling local food), making it one of the best places to go to if you’re in for some culinary adventures with a wide variety of food. Even though some fall into the ‘fine dining’ category, the overall dining atmosphere follows the general laidback nature of this quiet coastal village area. Cafe Batu Jimbar is one of Sanur’s well-known landmarks, comprising a restaurant and a café. The restaurant is best known for its all-embracing use of fresh organic ingredients, as well as a main venue for its anticipated regular Sunday morning organic markets. Naturally, most of its diners are from the health conscious crowd, but its food and presentations are delicious and top notch. Location: Jalan Danau Tamblingan no.75A, Sanur. Art Café Sanur, now located in new premises on Jalan Danau Tamblingan, is open daily and continues to serve its loyal clients with all-day breakfasts, lunch and dinners, with an expanded menu featuring innovative dishes created by Executive Chef, I Komang Edi Saputra. The restaurant’s relaxed ambiance is best experienced during dinner time, with its subtly-lit foyer and soothing interiors lined with attractive décor and original paintings by local artists currently working in Sanur. Location: Jalan Danau Tamblingan 82, Sanur. 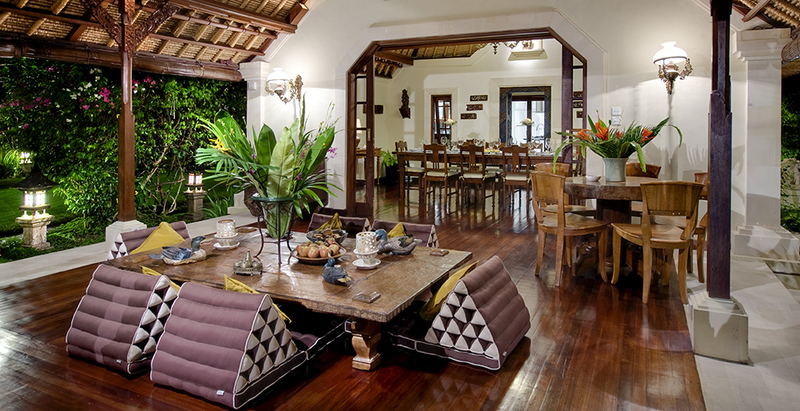 Three Monkeys Sanur is the urban-style extension to its sister rice field-side café in Ubud. Located on Sanur’s Jalan Danau Tamblingan, Three Monkeys presents an eclectic choice from its menu, and serves them up with cool jazz tunes. Plush sofas under a shady terrace and under the shades of white parasols and frangipani overlook the sidewalk and an upper level with air-conditioned indoor dining serves as an alternative option for those who want to escape the heat.